Impulsive gadget buying has a long (if not proud) tradition dating back to the late-night TV infomercial, but the introduction of online shopping has juiced the practice up to unprecedented heights. On top of that, the fact that you can power pretty much anything via USB these days has opened up a whole new world of weird-yet-useful-but-still-weird products you can use just by plugging into your computer (or phone charger). Here are some of the best/weirdest. USB extenders have been around for a while now, and help give you easy access to inconveniently located USB ports on a desktop computer. 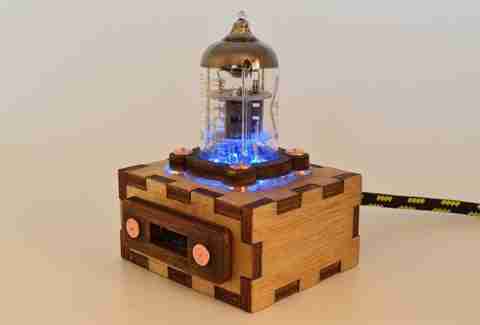 This one's exactly the same as all the others, except it's got a serious steampunk thing going on courtesy of the wood construction and retro vacuum tube at the top. It doesn't get much simpler than a row of LEDs stuck to a USB strip, but that simplicity means you can take these things wherever you go. Yes, the most practical use is as a wall-mounted nightlight, but you can probably find plenty of other things to do with them... right? If you're the kind of person who shouts "It's five o'clock somewhere!" across the office at any available opportunity, you should probably pick up this tiny drink cooler -- it's big enough to fit two cans (or one bottle). You should also probably rethink your office behavior. Haven't you ever wanted to look at something really, really, really up-close and personal? 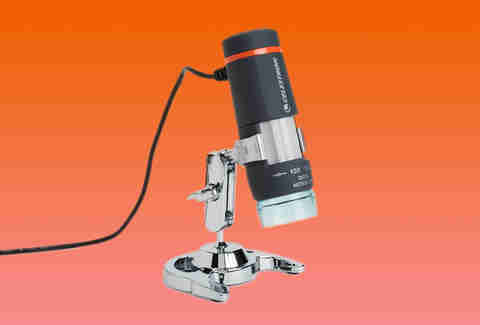 You can totally do that with this USB microscope. Just plug it into your computer and install the included software, and you're ready to start examining parts of your body at up to 40x magnification -- at your own risk, of course. If you'd rather have a tiny, flexible camera you can use to find the fork that fell between the oven and the kitchen counter, this is your jam. It plugs into your computer (or smartphone! ), and it's even waterproof in case you need to fish your wedding ring out of the toilet. Wait, why's your wedding ring in the toilet? Yes, your computer already has a clock that'll show you the time... but does that clock also provide you with a continuous gust of cool, refreshing air? Does it impress/annoy your desk mates with its bombastic, oppressive nerdiness? If the answer to both those questions is no, then the choice is clear: buy this ridiculous fan clock. You might say that the point of slippers is to keep your feet warm as you walk around the house. You might also go on to question the usefulness of a pair of slippers that must be plugged into a computer (or outlet) to provide heat. Then again, if you have a portable USB power pack, you can side-step that issue and comfortably shuffle from room to room with warm, sweaty feet. Spending long hours at the computer necessitates the drinking of warm beverages (like coffee) -- but most mugs don't keep those beverages warm for very long. 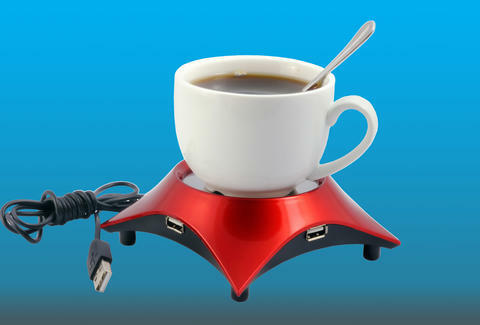 Unless, of course, you have a combination USB hub/drink warmer, in which case you'll never have to worry about microwaving cold coffee again.